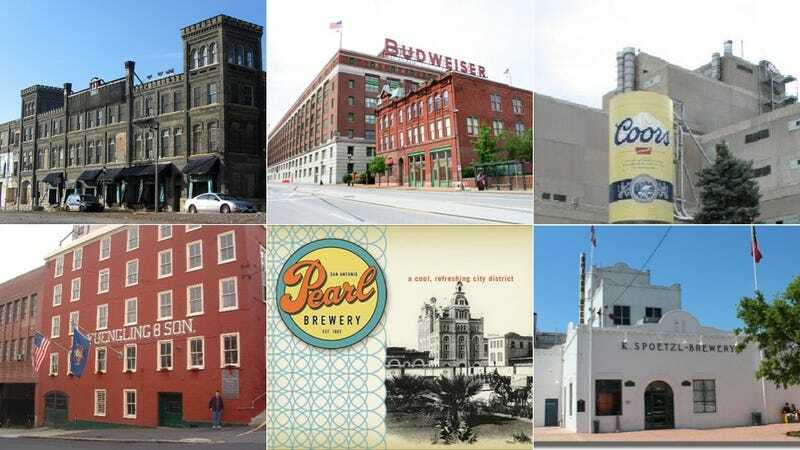 Beer is a staple of Americana, so it's only suitable that the buildings where it's brewed are often classic examples of American architecture. Even though some breweries eventually fall into disrepair, either because the brewer shuts down or because it moves, many of those have been given second lives as loft apartments, hotels, restaurants, and shops. So while you're imbibing this holiday weekend, don't just think about the flavor of the beer you're sipping—contemplate where it came from. The Budweiser Building is the oldest of the company's U.S. facilities. It still produces beer and is a symbol of the City of St. Louis. This is the former Milwaukee home for Pabst, which was was, at one point, the largest brewery in America. This building remained in stasis, largely abandoned for many years, but the city is trying to redevelop it as retail, offices, and apartments. Somewhere between San Antonio and Houston, you'll find the home of Shiner Beer in a building that looks like a close cousin of the Alamo. Responsible for the delicious nectar that is Shiner beer, it was founded by a German immigrant brewer in 1909 and remains one of the largest independently owned and operated breweries in the country. Not far south of Spoetzl is the Pearl Brewery in San Antonio. It was founded in 1883, but this actual facility stopped pumping out brews in 2001. Here's another happy ending—it was turned into a cool, award-winning, LEED-certified spot with places to eat, drink, and shop. New Belgium Brewery was started in the early 90s by a couple who actually cared about sustainability. The building was made from reclaimed materials, with features like chairs in the tasting room made from old bike rims or desks from used bowling lanes. And everyone that works for the Colorado company gets his or her own bike to ride to and from the beautiful building. The Victorian-style American Brewery was built by a family of German immigrants in 1887, and grew to be the largest brewery in Maryland. The central tower was busy as a grain elevator. But the success didn't last—Prohibition forced the brewery to shutter, and it was eventually abandoned and left to decay. But again, someone recognized its beauty and its recently been restored and now serves as the headquarters for Humanim, Inc.